Welcome to the Joseph Steiner House in beautiful, historic Brewer's Hill. Enjoy quiet comfort in your cozy, bright room in our historic home. Built in 1872, with all the modern conveniences, and the pretty Milwaukee city skyline in view. PLEASE NOTE REGARDING THE ROOMS: We actually have 2 rooms available however the 2nd is is only available if you book 3 or more. The 2nd bedroom is strictly for overflow from the main room. Our historic Victorian was built in 1872, but has almost completely been re-done inside and out. It is also the home-office of Milwaukee's Shakespeare in the Park. We have 2 bedrooms available but will will only for book them for a single party. In other words, if there is 1 or 2 of you, you'll be in the main room. If there are 3 or 4 of you, you're welcome to both rooms. We never rent both rooms to separate parties. Our listing looks like you can only book the single room. If you're interested in both rooms, simply select 3 or 4 guests and you'll automatically get both rooms. Note: If you're a party of 2 but you'd like both rooms, just select 3 or more guests when making your reservation. As is typical of historic homes, the bedrooms are cozy (read: on the small side) but there's room for 2 plus suitcases. Both rooms are lovely, clean, airy, and comfy and are furnished with an eye to fitting in a little with the home's history. The primary room is also still a work in progress with a few more cosmetic projects, such as finishing the hardwood floor. There are stairs leading up to the front door and your bathroom is on the first floor. The bedroom is on the second floor. If stairs are a concern, please note this configuration. We have a dog, Trystan and the first thing we do when you arrive is introduce you. He can mingle or hang out in his kennel. He's fine either way. Bedroom 1: - A real bed - a soft, queen-sized Beauty Rest. - A wing back chair and reading lamp. - An antique knee hole desk with a Windsor style chair. We keep an extension cord plug on top of the desk to make it easy to plug in your phone, laptop, or whatnot. - Wifi access. - A coffee maker in your room is stocked and stowed for easy set-up. - The bookshelf with empty space for your items and a movable mirror on one of the shelves. - Ceiling fan with dimmer lights and a dream catcher. - A closet with hangars and a basket with a variety of essentials just in case you forgot something at home. - Antique carpet. Bedroom 2: - Full sized bed with lots and lots of pillows. - WiFi access - Bright with lots of light. - Decorated on the soft, floral side. - Ceiling fan. - Tall 'bar-height' chair. - Area rug. Your bathroom... - Is downstairs on the main floor. It is 100% for your party alone. - The shower is stocked with shampoo and soap and plenty of towels. In addition to your room and bathroom... - You're welcome to the downstairs 'library'. Cushy sofas, pillows, footstools, and the wood burning stove. Feel free to make a fire. Very cozy. - The kitchen. There's a coffee set-up in the main bedroom, but we stock lots of tea and cups. You're always welcome to use the shared kitchen. There's a microwave and the other usual features. NOTE: We offer our room(s) only via AirBnB which means that we don't book the room(s) outside that system. Thank you for understanding. The Joseph Steiner House is a registered historic home within a 6-square block designated Historic District - beautiful Brewer's Hill. The area is located just up the hill from the old breweries that made Milwaukee great. The beautiful brick buildings are still there and have been re-purposed for other uses. There's plenty of free street parking and it's a nice neighborhood to walk. We encourage you to check out the other Victorians via a stroll. Brewer's Hill is a 15 to 20 minute walk from 2 other fun and eclectic Milwaukee neighborhoods - Brady Street and the East Side. The downtown Milwaukee skyline is also within view, is less than a 5 minute drive, and is beautiful all lit up at night. Amis français, ce airbnb est probablement un des meilleurs de Milwaukee. Bel accueil, belle maison, tout est pour le mieux. Suzan nous a reçus très chaleureusement et elle nous a parfaitement renseignés sur la ville et ce qui devait être vu. Sa maison a beaucoup de cachet et est située dans un quartier agréable. Le lit est très confortable ! Nous avons pu accéder librement aux parties communes et au très joli jardin. Comfortable and cozy. Susan was so flexible for checkin and checkout. Their big dog Shadow was friendly and unobtrusive for a not so big dog fan like me. Susan was a great hostess! I sent my 17 year old son to stay at her house with his friend for a basketball game I surprised him with for his birthday. Another Airbnb host rejected my reservation (not that I blame him), but Susan trusted that the kids would be courteous and respectful. The boys had a great time, and especially love the dog there! My son had nothing but good things to say about their stay, and repeatedly commented on the amazing softness of the bed, haha. I will definitely keep her place in mind if we plan a similar trip! Susan and her husband were delightful hosts. Their home is a gracious, historic gem on Brewers Hill. It's close to everywhere you want to be in Milwaukee. My bed was so soft and cozy. I would stay here again! Susan and her husband were so welcoming, their personalities and home was so inviting! It was a beautiful house and it really made us feel at home. They also had had complimentary water, candy, and granola bars which was great, as well as a sweet dog! El Parador is on the west side of downtown. The building is under renovation. This room is in this new section. There is a microwave, coffee maker, and refrigerator. Yet. This is a good low budget option for any traveler. This is a "must stay place. Great host! Very flexible with your schedule! And will work with you if you need too! Overall great experience! Host was flexible and accommodating. Although I didn't partake, the coffee and available food was appreciated. Good value. Clean and everything worked. It's one bedroom of a 3- bedroom apartment. The room is small but the shared space includes a kitchen, bathroom and living room. Javier was very responsive and attentive to my needs. the neighborhood itself is not very good bu (I'm not sure if it is safe Or not. )It's about a 15 minute walk to downtown and there's a bus stop a block away that will get you downtown faster. Francisco is a great host. His place is very clean and very close to downtown at a great price. We will always look for availability here when staying in Milwaukee in the future! Nice, clean studio apartment walking distance from downtown! It has the most comfortable queen bed and a small kitchen and large bathroom. My personal things are kept inside the apartment, but I do not have much so it is always very clean. Wifi is free! The building has a strict policy on noise after 10pm. This also includes any partying! The building is for students, most who are in very difficult classes and spend a lot of time studying. They also like their privacy. Keep this in mind!!! The apartment is near the Potawatomi casino and Miller Park, and also has good food options within walking distance. It is around a 15-minute drive to the airport and there are many Uber/Lyfts in the area. Hannah provided thoughtful amenities, such as coffee/tea and candies. The space was perfect for a one night stay. We easily found free street parking a few streets away, thanks to Hannah's clear instructions. Hannah’s place was ideal for my stay in Milwaukee! She was very responsive to messages and provided all of the amenities I needed for my stay. Good location, easy check in. Parking was a bit tough due to construction and weather, but that's pretty standard for Milwaukee. Loved our stay. Great location and Hannah made sure we were really comfortable, adding personal touches to make our trip great. Highly recommend!! Hannah was a great host! Unfortunately we couldn't stay because of an issue with the place. Hannah was more than helpful with dealing with the issue and getting us a refund. Awesome, super close to everything we needed for a great time! Great for a short stay! Not very close to many bars or downtown walking wise.. you will need to uber if you’re here in the winter! Overall great for the price and a short stay! Perfect location for downtown arts & entertainment. This newly constructed luxury loft building sits in the historic Pabst Brewery district and is walking distance Marquette University, The Fiserv Forum and MSOE. It's located west of the river away from the hustle & bustle of the city life but still in a prime location downtown. Enjoy the best Milwaukee has to offer in our 1 bedroom/1 bathroom apartment. One queen bed, sofa & air mattress available for extra sleeping. Fully-stocked kitchen with granite countertops and a Keurig coffee maker to enjoy coffee in the morning. TV with a Roku and Netflix and free WiFi! There's a stackable washer/dryer inside the apartment for your convenience. Located in the historic Pabst Brewery district. A half mile walk to the Fiserv Forum and less than a mile to Marquette University or MSOE. Marcus Center for the Performing Arts, The Pabst & The Riverside Theatre are all a mile away. Nice place with great location! Ruthies place was awesome. I was in town for a basketball game and get location was right down the street. The place was super clean and I've never had a more stress free trip because of Ruthie. Awesome place, great location, spacious, super clean, super comfortable bed. Highly recommend! Great location! Basic 1 bedroom apartment in a hotel like apartment building. Didn't spend too much time other than sleeping in the apartment. Lots of storage room in the cupboards, would be good for an extended stay. A beautiful space; very clean and spacious! Ruthie responds extremely fast! There is also a hair dryer provided which is very nice so you do not have to pack. Location is so close to the new Fiserv Forum and great restaurants and bars! Ruthie’s place was a perfect fit for our weekend trip. The location is perfect for the downtown area and is walking distance to the Fiserv Forum. El Parador is conviniently Located in Downtown Milwaukee's west end near Marquette University and the new Bucks Arena, and easy access to all downtown events and festivals. You’ll love El Parador because of the comfy bed and the Location. El Parador is good for couples, solo adventurers, and business travelers. This is my second stay at Francisco Javier’s and that fact alone should show I’m a happy customer. The place is spartan and simple, but the price is great and it always serves my needs. Plus, for a lower-priced Airbnb he offers some great amenities. Francisco was a great host and accommodated us last minute! Great amenities. Easy access to downtown. Would definitely stay there again. We were welcomed warmly by Franisco, to this up and coming neighbourhood home. The place has such a fun character and rich history with the breweries in town. Our room was a decent size, comfortable bed, welcome basket full of toiletries, and cork board with helpful tourist maps/things to see in milwaukee. We would come back again anytime! Francisco's place was a 5-10 minute drive to downtown Milwaukee. The neighborhood was quiet and we walked my dog at night and during the day and never felt unsafe. It's in the middle of a great little community with a lot of parks and community gardens. The house itself is absolutely charming and Francisco was great to deal with! Everything was so convenient. Lots of bathroom and kitchen amenities were provided and there was even a little welcome basket on our bed when we arrived! Francisco was always available, but it really felt like our own private space. I highly recommend staying here if you want a cozy stay close to downtown! Francisco provides a secure, restful environment for travelers. As someone who was travelling for work, I really appreciated the breakfast supplies he provided, the locked door to my private room where I could comfortably store valuables like my work computer, and the EXTREMELY comfortable bed. I am also a big fan of pillows, and he provided some truly excellent ones and plenty of them. All linens were perfectly clean, which I am a stickler about, and the bathroom was spacious and also quite clean. The location is great, very central, and I was even able to park in the driveway, which made moving things in and out a breeze. I recommend Francisco's place wholeheartedly to anyone who wants a great stay in an excellent location! Francisco Javier is a very nice person, very helpful and very willing to help you with a challenge. His place is very worthy of staying a night or two or three. Although simple, the rooms are clean and tidy. You get cereal, milk and eggs as a simple breakfast if you choose to eat there. Francisco Javier also adds little snacks in your room. Nice touch. The rooms are pretty close to downtown. I will mention the area is not the quietest, but manageable. I use an app called Relax Melodies to drown out the noise. I must say that Francisco Javier is preparing some of the rooms for handicap accessibility for the future. In conclusion, due to cleanliness, location, reasonable rates and friendliness of the owner, I highly recommend anyone to spend time here. Wonderfully kind, attentive host, and very home-y stay! We love living on Brady Street and we think you will enjoy it here too. We are walking distance from everything you'll need including restaurants, bars, Walgreens, CVS, Starbucks and other coffee shops, and two grocery stores. We are also about .7 miles from Lake Michigan and 1.5 miles to Summerfest. You will also love our roof. At our place you'll be in a fun part of Milwaukee to explore, but will also have a nice retreat to return to. We also offer a basic breakfast to our guests. The house we live in was constructed in 1890 and has lots of old home charm. You'll have access to our living room (with a TV), dining room and kitchen. We share a bathroom, but this hasn't been a problem. Your room is cozy, with everything you need including a Keurig coffee maker, an iron, a place to hang your clothing and A/C. The bed is Queen size. You'll have WiFi access during your stay. Feel free to let us know if there is anything you feel is missing and we will try our best to accommodate you. This air bnb is a great spot with easy access to many spots in the city. I appreciated Cori's communication with me regarding the stay, and her ability to to meet me in person the day of our stay. I would recommend this home for anyone considering a visit to Milwaukee. Very homely decor and situated perfectly on Brady St! Nice bedroom in a nice apartment. Cori was super nice and gave some good local tips! The big terrasse is amazing! The apartment is very cozy and stylish. Cori & Adam are friendly hosts. The weakness is that there is only one bathroom and it is sometimes not very convenient for travelers. Great location, great communication, great recommendations from the host. Would stay again! What an awesome couple. Stayed for a concert in Milwaukee at a clean cool location. Very stylish and fun. And a great breakfast to boot!! Will be back for sure. No need to look elsewhere!! Cori's place is incredibly convenient and comfortable and Cori is a perfect host. Cori and Adam’s place is the cutest apartment on the most scenic strip. Guests will get a cozy apartment filled with charm and character in the heart of the hustle and bustle of Milwaukee. Amenities include a patio with an amazing view of Brady Street, and the location is walking distance from great restaurants, clubs, and the Fiserv Forum. When I come back to Milwaukee, Cori and Adam’s home is definitely on the top of my list! Located in the Historic 3rd Ward, this studio loft is in an old tobacco warehouse refurbished into a luxury apartment building. The space is walking distance to the top restaurants and hot spots in the city. You can easily get to the apartment via I-94; 794; and I-43, with direct access to Downtown, lakefront & festival grounds. The place has a queen size bed, and a queen size pullout couch plus a twin air mattress if you have a full house. Brand new, modern, kitchen with granite & quartz countertops, a custom island with built-in butcher block, gas range, washer/dryer, refinished concrete flooring & free Wi-Fi. In the Historic Third Ward, you'll find locally owned restaurants, spas, theaters, galleries, and boutiques all in a historic warehouse setting. The neighborhood is home to the award-winning Third Ward Riverwalk and the nationally acclaimed Milwaukee Public Market. Located just south of downtown Milwaukee. Great space and excellent location. Within walking distance to every place we needed to be. Also, paid parking right across the road. Wonderful location, sleek modern decor. Such a great spot to spend the night in Milwaukee! Close to shops, bars and amazing restaurants. The space itself is very open, quiet and comfortable. This place was excellent. Super clean and stylish, plus very close to many great restaurants, bars, and coffee joints. Our host gave us some great tips of local places to check out, and was super accommodating. Highly recommended! Fantastic barbeque place right next door as well as a really good breakfast restaurant a block away. Right across the street from pretty affordable parking. There might have been a better option than that even but the lot was convenient so we went for it. Short walk to most downtown things and the river. The space itself was very nice with an industrial loft vibe. I'd reserve this again. Had a great stay. Close to shopping & restaurants in 3rd Ward district. Prompt response, clear instructions, an amazing loft, in downtown Milwaukee, you will NOT be disappointed! this place is great! it's super clean, quiet, and in a great location. Jean-Paul is super responsive too if you need anything. I'd definitely stay there again! Amazing one bedroom apartment in the heart of Milwaukee's downtown central business district & theater district. One block from Riverwalk Way & The Shops of Grand Avenue, steps from shopping, dining & entertainment make this apartment hard to beat! This one bedroom apartment has one queen bed, sofa & air mattress for extra sleeping. Incredibly convenient location makes anything you need only minutes away. A former department store in the 1920s transformed into lofts & updated with stainless steel appliances, massive windows & quartz countertops. Gorgeous architecture & original tile can be seen on the interior of the building. Riverwalk, The Shops of Grand Avenue, Pabst & The Riverside Theater are all a block away! This apartment wells great for our quick trip to Milwaukee. It was in a great location, we could walk to the 3rd ward in about 15 minutes. There were multiple restaurants close by. It was quiet at night. Never heard or saw any neighbors. It’s clear that no one actually lives in this apartment, at least recently, and therefore it was quite clean and clutter free. We would stay there again. Amazing location downtown, very stylish and the most comfortable bed ever! Charming place. It was everything we expected, and in a great location. We had such an incredible stay! The place was spacious, modern, and centrally located. Ruthie was great and quick to respond. Thanks for making our first trip to Milwaukee a memorable one. We’ll definitely be back to stay at this space soon! Great location in the center of downtown and comfy living quarters, we would stay again for sure! We loved our stay at Ruthie's! The location is incredible, right in the middle of downtown. The entire place was immaculate, and it was the most comfortable bed I've slept in on a vacation. Would highly recommend! This beautiful studio apartment is on Kilbourn Ave , a newly renovated historic building in Milwaukee, Wisconsin within steps of Marquette University Campus. Walking distance from several of the City's finest restaurants and bars, the location doesn't get much better. The Apt on Kilbourn is set up like an extended stay hotel room, with brand new furniture as of September 2018, kitchenette and 50 inch smart tv wall mounted. Located within blocks of major downtown Milwaukee attractions. This is the Marquette University Campus area, great location for prospective students or alumni. Marquette is located on a 93-acre (38 ha) campus in the near downtown Milwaukee neighborhood of University Hill, on the former Wisconsin State Fairgrounds. Lake Michigan is roughly one mile east of the edge of campus. The campus stretches 12 blocks east to west and 5 blocks north to south. Wisconsin Avenue, a major thoroughfare in Milwaukee, bisects the campus, placing academic buildings on the south side, and residence halls and other offices and buildings on the north side. Named after the university, the Marquette Interchange, where Interstate Highways 43 and 94 intersect, is also close to campus. Nearby attractions include the MIlwaukee Public Museum, The Miller High life Theatre, The Pabst Theatre, Marcus Center for the Performing Arts, The Riverside Theater, BMO Harris Bradley Center, The Rave Eagles Club, Potawatomi Casino, Discovery World, Miller Park, and The Wisconsin Center among many other attractions. You'd be hard pressed to find a better location! Great weather . Great location . Louie's place was exactly as advertised. It was simple and had all the essentials that were needed. I would definitely stay here again. The apartment is very simple, but it works for a place to stay! Very close to food and a short drive from downtown. It is also right on campus, so if you are looking for a college town feel it is a good location! Louie is also very fast and efficient with communication if you ever have any questions. great location, will stay here again for sure. I had a great stay in Louie's place. It was clean, efficient and well located. I took a Lyft to the Wisconsin Center. It was a $6 fare. I could have walked the distance in 15 minutes, but I was always running behind! The furnishings were simple but useful. I especially liked the desk chair, and I made use of the WiFi. The location right next to the Marquette campus makes it super convenient. Enjoy your stay! Welcome to HOUR Place, on the edge of Downtown Milwaukee, blocks from Marquette University and the new FiServ Forum. The house is "fully handicapable" with front and rear ramps, an elevator, and a handicap shower. *please notify us of handicapped guests. *We offer a large living and dining area, multiple bedrooms, great closet space and lots of windows to catch a little sun when we get it. The house is right outside of the main downtown event spaces and destinations. Join us at HOUR Place. Very large space, "handicapable" friendly space(ramps, accessible shower, wide hallways and door entrances), security door, exterior wifi cameras, large stainless steel French Door refrigerator, stainless steel stove, stainless steel dishwasher, microwave, 47" television. Neighbors are all homeowners, friendly but private. There is a large park just two blocks east. The best part of the neighborhood though is the proximity to everything being less than 8 minutes from the Lake, and 5 minutes from the heart of downtown, and 2 minutes from the Marquette University Alumni Memorial Union. Great location met our needs and can't beat price. the house was even better than we expected it to be, plus the location was great!! H.O.U.R. Place, in the heart of Milwaukee. Welcome to my gorgeous cozy studio! Centrally located in the Lower East Side neighborhood, just one block away from the iconic Brady Street, and minutes from the new Milwaukee Bucks arena, Summerfest grounds, and Museums & Shopping boutiques. My place has a Walk Score of 92 out of 100 which means this location is a Walker’s Paradise so daily errands do not require a car. Updated apartment with awesome amenities, granite countertops, and onsite laundry. This studio apartment consist of one large room that serves as the living, and bedroom. The room has one queen bed and one sofa futon. If you are traveling with extra guests we also have included one air mattress. Since this is a studio apartment, using both the air mattress and sofa futon at the same time will limit the amount of floor space in my apartment. The Lower East Side serves as a microcosm of the outlying East side neighborhoods and the city itself. Destination streets like Brady and North Ave are at an arm's reach, as is Lake Michigan and downtown to the south. Dynamic bars and lounges rub shoulders with established cafes and sumptuous restaurant options in this hip hood. New residents drawn to the area include students and singles. Parks and green space dot the Lower East Side, and abundant businesses and other services make it very walkable. This area is centrally located, making it a great option for those looking to commute to the downtown area. Options for entertainment and socializing abound, enhancing the neighborhood's popularity. nice space for the money; a bit smaller than expected but overall decent place. Great place, super clean and close to everything! Terry was a great host. Cozy and clean place, very convenient location. Great host! Had a great stay! Apartment was very clean and cozy. Located in a great area and parking was easy to find. Terry was very communicative! Fantastic space, awesome location, parking was a 10+! Great value and great location. I actually like that it's a studio - it's like a hotel room but better with the kitchenette. Very clean. No complaints. Fairly new & modern apartment, located in the heart of the East Side, just steps away from the nightlife, shopping and entertainment offered by Brady and Water Streets. Walkable to Lakefront, Riverwalk and downtown Milwaukee. Right on Riverwalk, this provides an easy and beautiful walk all the way to Third Ward! This 1 bedroom apt has everything you need for a wonderful trip to Milwaukee! 1 bedroom with 1 queen bed, air mattress & sofa. Radiant (heated) wood-grain floors, granite countertops, large bathroom with bathtub, and high-end stainless steel appliances, a large balcony, and access to a private fitness center. A fully stocked kitchen so you may enjoy coffee in the morning with a Keurig and coffee pods. TV w/ a Roku with apps such as Netflix and free WiFi! Street parking is generally available in the area. The apartment faces a busy intersection, so the traffic noise can be heard in the apartment at times. Within walking distance from the lakefront, art museum, Veteran's Park, Summerfest, Milwaukee Public Market, Third Ward, East Town & West Town neighborhoods. Indoor parking is nice in the winter. Note - you have to walk outside from the garage to get to the front door. Took a bit of wandering to find that out. Not a big deal, just a heads up. The lobby is very nice. Didn't spend any time there, but it looks good. The bathroom in the unit is massive, which is nice. Serviceable kitchen and dining area. Large bedroom. Good deal for the money, especially in that neighborhood. Great place. Trendy, in a hip part of town, close to all the downtown fun but far enough away for a quiet glass of wine on the balcony. Check In with parking was involved (downloading an app, parking separate from the building) but it was EASY with the instructions given. Would absolutely stay here again. Cool location, right by grocery store and bars and downtown. The People who run the air bnb were not responding on my final day when the roof was leaking and there were puddles under the dishwasher and fridge. Gave me a “partial refund” of 25$ for the 89$ a night when I had to deal with dripping water from the bedroom and puddles, how cheap can you be? Until they sort out the management for this air bnb unit and get the apartment up to code, I won’t be back. We stayed at Ruthie's place on Water Street and absolutely adored our time there. Not only is the space in a prime location in downtown Milwaukee, it is hip and beautiful. The view from the bedroom and living room is stunning. We enjoyed a beverage on the balcony and loved being in the midst of a city view. The apartment had countless amenities such as a washer and dryer, iron, Netflix, and so much more. Ruthie was extremely accommodating and willing to help, but no assistance was ever necessary because she made the whole process so convenient. We really enjoyed being able to access everything and have a speedy check-in/check- out without needing assistance. We highly recommend this apartment for anyone looking for a trendy, clean, and all around perfect place to stay while in Milwaukee. Loved your place. Check in and check out info was outstanding. Loved the inside parking. Great view. Perfect location to have dinner and attend a Bucks game. Overall great rental for our one night trip. Great location, quick communication from host, beautiful set up. Spacious place with a great view of Milwaukee! This listing is for one room. If you are interested in renting the whole house, please see host's other listing. You are also invited to book two or three bedrooms for a larger group, if you don't feel you need the privacy of the whole house to yourself (meaning you will occasionally bump into me!). A beautiful, comfortable home, five minutes to downtown Milwaukee. Visit the world famous Harley Davidson museum and plant, the Milwaukee Art Museum designed by architect Santiago Calatrava, attend one of the numerous music festivals, and much, much more. Milwaukee is a park filled city on Lake Michigan, and you will not run out of things to see, do, and explore here. The home is light filled and very comfortable and there is an enclosed garden with a deck. When I am away, you can rent the whole house - just inquire. Pricing is different for that option. The house has three bedrooms and two and a half baths. The kitchen/dining area is an open, beautiful space. The kitchen is fully equipped for preparing meals. I can have coffee or tea for you in the morning - let me know your preference. The house is located in a residential neighborhood, close to restaurants, shopping, tourist attractions, and two minutes access to the freeway. City bus lines are one block away. I am happy to advise you or direct you to any place you would like to visit in the city, or nearby. Wifi access is available at no charge within the house. Kerry did a great job keeping in communication with us. Her home is exactly as listed. She is super sweet and gave us suggestions for where we could visit in the area. She also allowed us to keep our bags at her place after we checked out because we were driving around Milwaukee and did not want to leave them in the car. Had a great stay at Kerry's place. Nice central location. The place was very clean and comfortable. Would definitely stay there again. Kerry was extremely accommodating and flexible. A++ communication, very clean house. Thank you for the nice breakfast and pork chop is cute! Kerry was excellent at communicating everything we needed to know. Her home was lovely and we enjoyed our stay. The description about this place is spot on. It is a super short drive to downtown, easily found and comfortable. We were able to come and go as we pleased and Kerry communicated everything we needed to know before hand. I would highly recommend the Zen Den for anyone on a weekend getaway. Kerry's house was the perfect place to stay for a quick trip to explore Milwaukee. She was extremely accommodating and helpful when suggesting places to eat and visit. Her directions upon arrival were spot on and welcoming. Good vibes only! Great place and very nice host. Great place, will stay again. Enjoy a cozy stay at this historical building, within walking distance from the lakefront, Art Museum, Veteran's Park, Summerfest, East Town & West Town neighborhoods. Enjoy the best Milwaukee has to offer! This 1 bedroom apt has everything you need for a wonderful trip to Milwaukee! One queen bed, sofa and air mattress available for extra sleeping. A stand-up shower, high vaulted ceilings, as well as a kitchen stocked with cookware to cook simple meals. Enjoy coffee from the Keurig, TV with a Roku with apps such as Netflix (there is no cable). Window unit AC & free Wi-Fi! The fireplace located inside the apartment is strictly off limits. The apartment is located in an older building. It has radiator heat and window unit AC. It may not be for everybody. Quiet street in the middle of the city within walking distance from the lakefront, art museum, Veteran's Park, Summerfest, East Town & West Town neighborhoods. This apartment was spacious and bright. I loved the architectural details. We only stayed one night in Milwaukee to see a concert at Turner Ballroom. This location was great! It was only about a 15 minute walk. Very close to plenty of other downtown activities too. Ruthie’s place was a great stay. We had an easy check-in & were greeted with a bottle of wine! The bedroom’s private balcony was nice too - although the stairs in/out were a little awkward. Great value for a great space, I would definitely stay again! Nice calm location in a great city. Parking is available on side streets surrounding building. Ruthie left great instructions helping us with our stay. Only complaint would be the building is older and is structurally loud. Between the creaky stairs/floors and the loud dog downstairs, it made it a bit hard to sleep soundly through the night. This apartment was great for our quick weekend stay! Everything was fine! The building itself is pretty old, but the apartment is nice and clean. A great spot and would recommend to friends! Ruthie was quick at accommodating our last minute trip. She was very responsive and detailed about our easy check in. We had some issues that she had addressed after our stay, and made sure we were happy with the outcome. Other than a slight disturbance, she was not hesitant to fix the issue. Very cute place and super convienent location. Ruthie responded very quickly with any questions we had. Recommend staying here! Great host and stylish space. Close to everything and very easy check in. I especially loved the nice bottle of wine there as a welcome gift! I Definitely recommend. Thanks! Located in the Historic 3rd Ward, we're walking distance to all the attractions & amenities of the city. With proximity to I-94; 794; and I-43, direct access to Downtown, lakefront & festival grounds, you could say we're perfectly located. We're 6 blocks from Wisconsin Avenue, walking distance to major employers/office buildings. You'll find yourself walking distance to all the summer festivals, Gallery Night in the 3rd ward, Jazz in the Park & more! One bedroom with a queen bed, sofa and queen air mattress available for extra sleep space. There is a washer and dryer in the unit in case you need to wash clothes during a longer stay. There is a TV with Roku for Netflix and other entertainment apps. Enjoy coffee from our Keurig coffee maker & free Wi-Fi! Just a few blocks from the lakefront & Summerfest grounds! Located in the trendy 3rd Ward neighborhood, home to some of Milwaukee's finest shops & restaurants. Shopping in cute boutiques, eating at the Public Market and some dinner in the Third Ward is a perfect day spent in Milwaukee, all within walking distance. Great host and a very nice place to stay! This place is super recomendable thanks to the location and commodities. The place was surprisingly clean and fresh, also bigger than I tought. Really easy check in \ out using the lockbox. The parking is a plus, everybody else is charging extra for it. The host was perfect, instructions clear before and during our stay help a lot. For sure I'will be back there again. This experience was outstanding. The communication was quick. The check in procedures communicated the day before check in was the best detail I have seen with any other AirBnB. The condo was great. Clean with lots of light from the well placed windows. The bed was super comfortable. Best of all I did not have to worry about parking. This would be an outstanding location for Milwaukee’s world renowned Summerfest event. Thanks for the bottle of wine. Really comfortable and convenient apartment! Had everything we needed and is within walking distance to all the shops and restaurants in the Third Ward - plus the lake and the art museum. The only thing I would tell future guests is that the sunlight in the bedroom is BRIGHT in the morning and can heat the room up. We could also hear the music from the festival pretty clearly - not necessarily a bad thing, but good to know before you arrive! Thanks Ruthie for being a great host! Your constant communication was very appreciated and the check in/out process was a breeze! Great place, everything matches the description! Very clean, comfortable bed! Lots of space to hang out in! Location, location, location! Large, classy, timeless, and comfortable. Entire top floor with private entrance into our house located in the Lower East Side of Milwaukee. The unit below is a newly remodeled upscale coffee shop. One block from Brady Street, within walking distance to the brand new Fiserv Forum, and downtown Milwaukee. Wifi/Netflix/air/heat. Perfect location on the Lower East Side, Milwaukee. The home is a warm classic with hard wood floors and restored original brick wall. It is the top floor of a late 1800s restored house on a very nice semi residential street block. 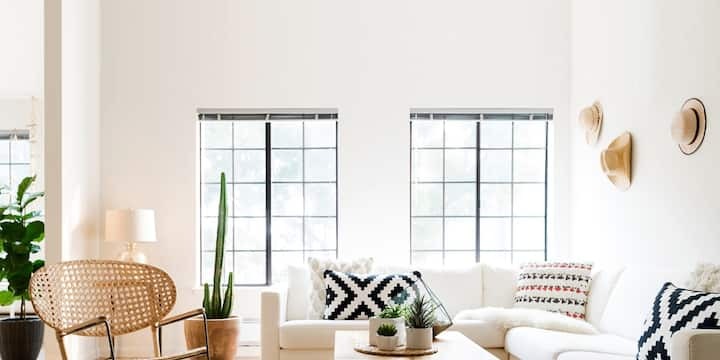 The seven windows in the living room give the home a warm-relaxed feeling. It has a beautiful totally functional stove for cooking, generous amounts of pots, a brand new microwave, and a full size refrigerator in the kitchen. The feelings are cozy, warm, cabin-like yet elegant. The kitchen and living room are in the same open area. There is a dining room table that seats 4, a beautiful brand new couch that folds down to become a very comfortable memory foam queen size bed that sleeps 2. There is also a TV with a Roku which is Netflix enabled. There is plenty of room to lay out the suede topped air-mattress that can accommodate 1 guest. Not to mention, the cream colored couch contains two recliners that comfortably sleeps 1. As you move through the living room, you will enter the large master bedroom with a queen size bed that sleeps 2. We included a blackout curtain over the window so your sleep will not be interrupted. Unless, you use the alarm clock located to the right of the bed! The master bedroom contains a large closet fitted with shelving and hangers that can accommodate all of your clothing. Gently nestled between the kitchen and master bedroom is the bathroom. We include complimentary body soap, shampoo & conditioner, and body lotion. We also make sure to include more than enough towels for the length of your stay. As for the location of the home, it is perfect. The Lower East Side of Milwaukee is the most centrally located area in all of Milwaukee. Not only are you within a mile of the brand New Fiserv Forum (home of the Milwaukee Bucks and Marquette Men's Basketball), but you are also one block away from a beloved Milwaukee thoroughfare for decades. Brady Street is an eclectic, colorful street that’s popular for diverse dining options, a vibrant bar scene, and the city's best salons. Visit for a spa day and shopping, and stay to watch see the street come alive at night. As for going out to dinner, Brady Street also has the answers. Check out "Sanford" for a chef's tasting menu of creative, upscale New American fare & wine served in an elegant venue. The newly opened coffee shop/diner on the lower level of the property is up and coming. "Interval" combines a casual coffee shop vibe and an upscale dining experience. If you don't feel like doing much you can always take the 1 block walk to the East Point Marketplace for some casual quick bites like Panera Bread, Chipotle, Noodles and Co., or Jersey Mike's (there is also a grocery store located here). Message me with any questions I'd be happy to answer! One block from Brady and Water street. Walking distance to downtown Milwaukee, Wisconsin Center, and Fiserv Forum. Jacob was an absolutely fantastic host. Any questions that came up were answered immediately. The apartment is so cute and well furnished. We had a great stay here. Jacob's place was great. His messages were more than helpful before we checked in and when we arrived. It's within walking distance to the Fiserv Forum and the Riverwalk which we enjoyed. It was more than spacious for the two of us, and we only wished that we were staying another night! Jacob's place is top notch! Located above a fantastic coffee shop and walking distance to literally everywhere we wanted to go to, our stay was better than expected & we also saved tons of money because we didn't have to take carshares anywhere! The space is gorgeous with plenty of space, clean, & cozy. Jacob was friendly and responded almost immediately to our questions. Entry to the place was super easy and there are no keys involved so there was no stress about that! Jacob's place is highly recommended for your stay in Milwaukee! Jacob's place was comfortable, clean, and close to many of the great things that Milwaukee has to offer. I visited on a Saturday with my wife and a few friends, and the place was spacious enough for all five of us. Bed was very comfortable, and the recliners and sofa provided excellent lounging. As for the location, it's walking distance or a quick rideshare to many great spots in Milwaukee, making it a good home base for a day out and about. Jacob was responsive to messages prior to arrival, accommodating, and offered us a friendly welcome to town. Definitely recommend. This beautiful studio apartment is in a newly renovated historic building in Milwaukee, Wisconsin. Walking distance from several of the City's finest restaurants and bars, the location doesn't get much better. It is within one of Milwaukee's only downtown gated communities, located on the border of The Historic Third Ward and Walker's Point, Just north of the Iron Horse Hotel. Newly redeveloped historic building from 1871. Formerly part of the Pfister Vogel Tannery complex. Walkers Point is THE neighborhood to live. Amazing restaurants on 2nd St are just blocks away. The Third Ward is a 5 minute walk down the street. Interesting location a bit off the beaten track but works well especially if you enjoy exploring urban neighborhoods by foot so that you can enjoy the layers of historic architecture and the redevelopment of older industrial neighborhoods to 21st c. use. Cool building and a chance to try out the aesthetics of a modern loft. Ground floor. Modest amenities. Very comfortable bed! Our stay at Peter's studio in the heart of Walkers Point was just incredible. First visit to Milwaukee and loved the area and the architecture, beyond impressed with what's been done to rescue and revitalize many old warehouses. Peter's place is within walking distance to many local landmarks, breweries, distilleries, coffee houses, and restaurants. The area was safe and the people were friendly. The studio itself is new and clean, looks fantastic just like the photo, is perfect for one or two people. The king size bed was one of the most comfortable beds I've ever had the pleasure to sleep on! There's a river just outside the lofts and a grassy area where you can play catch or frisbee and watch the sunset over downtown. There's also a running/biking trail that appears to snake along the river. MKE Airport is not far and Miller Park is also just a few miles away. FYI..one of the only baseball parks I've seen that has tailgating all day before the game! As for hotel like amenities that you might miss; there's a coffee pot but you'll need to bring coffee/cream/sugar (or Anodyne Coffee is nearby & that place rocks!) There's also no hairdryer or shower essentials such as shampoo so be sure to bring your own. Wi-fi was included and there's a large tv with cable and Netflix. No regrets choosing Peter's place, communication was easy and "check in/out" was a breeze. Looking forward to the next trip, we'll definitely go back! Thanks again, Peter! Location is absolutely fantastic! Downtown Milwaukee but just a few blocks offset to ensure relaxation and quiet from busy Water St. The amenities are wonderful as well, the building has a top of the line fitness center, gated parking and a washer/dryer in the unit. This has been my second stay and will be back again! Peter was a great communicator, trusting, and super easy to work with. Great apartment for one night or more! This was a wonderful experience. The apartment was pristine and a great space. It's in a very cool location, and the host was super responsive. I highly recommend staying here. Cozy one bedroom apartment in the heart of downtown MKE! Within walking distance to Water St, Brady St and Cathedral Square. The perfect place for professionals in town for just a night or a couple visiting the city for the weekend! More information available upon request. The whole space is yours to use minus one locked closet that has my personal belongings! Bedding, towels and full kitchen will be available for you to make your own! There is also a washer and dryer in unit available at no extra charge. My business partner and I travel to Milwaukee so much, we decided to get two wonderful apartments there, and post them to Airbnb in between trips. These Luxurious modern apartment are located in the heart of the East Side, in the middle of the best Milwaukee nightlife, shopping, and entertainment, courtesy of Brady and Water Streets. Walkable to Lakefront, Riverwalk and downtown Milwaukee. Right on Riverwalk, this provides an easy and beautiful walk all the way to Third Ward! This 1 bedroom apt has everything you need for a wonderful trip to Milwaukee! 1 bedroom with 1 queen bed, air mattress & sofa bed. Radiant (heated) wood-grain floors, granite countertops, large bathroom with bathtub, and high-end stainless steel appliances, a large balcony, and access to a private fitness center as well as an entertainment lobby. A fully stocked kitchen so you may enjoy coffee in the morning. TV w/ a Roku with apps such as Netflix and free WiFi! This unit includes Free, heated, underground parking on sight! If traveling with more than 1 vehicle, free street parking is available. Overall a wonderful place, I would definitely stay here again! A very comfortable and stylish place. Having covered parking in the city in the middle of winter was VERY nice. Check in instructions and all communications were clear and I had no issues. I can't speak much to the location as I didn't have time to explore. This place was perfect! Very cute, clean, and modern. The location was great and the building is very nice. Michael was a wonderful host. I will certainly be back next time I’m in Milwaukee! Highly recommend! Great location and very cool, stylish space. Our hosts provided great information to make our stay easy. Was my first time staying at an Airbnb and this place exceeded my expectations. The hosts are very friendly, and quick to answer any questions. The area is great. Plenty of thing to do in walking distance. Great location. Multiple breweries near by. Grocery store across the street for all your needs. Walking distance or short uber/lfyt ride to get just about anywhere in Milwaukee. Garage parking is a plus. Cozy unit with nice views from the living room or the balcony. Michael was a great host and the apartment was very comfortable! I highly recommend this host and would stay again! Everything was great during our stay. The apartment was clean, modern, and the check in process was easy. Would definitely stay here again. My brief stay at Michael’s place while in Milwaukee for a meeting was superb. Beautiful flat with all the touches you’d want in a home away from home. Great communication with the host and check-in was a snap. Michael set my expectations high and nailed every one. Highly recommended! Luxury Loft W/ Incredible Views, Parking, & Patio! Perfect location for downtown & Third Ward entertainment. This newly-renovated apartment sits in the historic Grain Exchange building and wedding venue. So luxurious, often used as a bridal suite. 1 block from Milwaukee Public Market, Wicked Hop, Benelux & Third Ward shopping. It's prime location for Third Ward & downtown fun. Very close to Riverside Theatre & right on Milwaukee's Riverwalk. Enjoy the best Milwaukee has to offer in this 2 bedroom/2 bathroom apartment. 2 queen beds, sofa & air mattress available for extra sleeping. There are 2 spa like bathrooms with a large walk in showers. The kitchen is large with granite countertops, stainless steel appliances and walnut floors throughout. Living room has huge skylight to allow natural lighting. Enjoy coffee in our Keurig style coffee maker and free Wi-Fi! Located in the heart of downtown Milwaukee, walking distance from the lakefront, art museum, Veteran's Park, Public Market, Summerfest, East Town & West Town neighborhoods. Nice apartment at the top of a charming historic building. Tastefully updated with thoughtful inclusion of original things such as hardwood floors and columns. All the basics for comfort. Glad to stay here. But make sure you notice that it's going to cost you an extra $15 for parking added to your cost. Ruthie's place was fantastic. Great location in Milwaukee. The place was extremely clean and very well decorated. The skylight was amazing. 10/10 would recommend staying at Ruthie's place. Stylish apartment in a great location. I was able to walk to my conference at the Wisconsin Center as well the Public Market and numerous coffee shops. Great location and cool place! Thank you! Great location, stylish place, felt very much like we were staying in a boutique hotel suite. Hosts were responsive and friendly. This was our first Airbnb and we would do it all over again. The apartment was amazing and Ruthie was a great host! The unit was clean and very modern, updated bathrooms were gorgeous. The location was even better- ideal spot for any Milwaukee trip! Thank you! Wonderful urban hideaway, easy to access and well stocked. Conveniently located in the Lower East Side neighborhood near shopping and restaurants and within walking distance to Brady Street, the lakefront, nightlife and entertainment. Enjoy all the amenities this building has to offer, such as a fitness center, rooftop terrace, conference room and free parking. 2 bedrooms with 2 queen beds, sofa and air mattress mattress available for extra sleeping. There is a washer and dryer in the unit in case you need to wash clothes during a longer stay. There is a TV with Roku for Netflix, Hulu and other entertainment apps. There is a gym in the building as well. Make yourself at home and don't hesitate to reach out with any questions at all! Conveniently located above restaurants and businesses and across the street from the grocery store, you will not have a hard time finding anything you should need. Great spot. Like really great spot. On corner of building overlooking Lyon/Jefferson. Very walkable to MSOE and Birch&Butcher. Convient Pick n’ Save grocery store across the steeet. Outstanding place to stay. Would definitely consider again. Host was very prompt to address any concerns. If I had to pick something bad to say about the place, I’d be hard pressed to do so. Maybe downsides are it’s right on the corner with many windows, so people could see in at night. Likewise because of so many windows the mornings are brighter in the bedrooms. Not a big concern as I am an early riser, however might be worth notice for those who sleep in late in dark rooms. I’ll definitely be back if the opportunity arises. Thanks! Great place! They have thought of everthing, even a bottle of wine! You won't regret booking this place. The home is EXTREMELY clean and comfortable and in one of the most ideal locations if you are visiting Milwaukee. This was my first time booking an Airbnb and I found it incredibly easy and convenient. The communication from the host was always timely and informative. It a very comfortable apartment, an spacious open layout, with good closet space . If you are a light sleeper, it can be noisy with traffic. But it is a great location. Ruthie's place is very comfortable and hotel like in its ammenities, which we loved. There is just about everything you would need to cook in the full kitchen. The grocery store across the street was so handy as well as the couple of coffee shops and chain restaurants for a quick food run. We got to use the gym which was very nice. The TV is a good size and has plenty of viewing options. For being on a fairly busy street it was very well insulated from noise and after about 10 we barely heard traffic until early morning. Big living room windows that made the apartment bright and cheery. It was cozy with it's Nest thermostat for the cold Wisconsin winter. For our purposes we were staying in more than going out so all of these things were of great value to us. The only issue we had were there are dogs on either side of the her apartment that get pretty upset when their owners are away. This didn't pose any issue from about 10 pm to 6 or 7 am but they would be barking quite a bit during the day. If you are looking for a place to sleep as you head to events or sightseeing, this is a great location. Close to just about everything in Milwaukee and a great apartment. If you want quiet during the day, you may want to try another of her properties! Spacious Apt w/ Parking + Patio | Walk Everywhere! One bedroom with a queen bed, sofa and queen air mattress available for extra sleep space. Brand new bathroom with tub and kitchen. There is a washer and dryer in the unit in case you need to wash clothes during a longer stay. There is a TV with Roku for Netflix and other entertainment apps. After a cancelled flight, I was able to get this spot in a pinch for that same evening. Ruthie was EXTREMELY quick on responding and confirming and the directions were perfect. The space was cozy, clean, and comfortable - the perfect retreat after a terrible airport experience. Highly recommend this space in MKE! Simple and clean digs in one of MKE's best neighborhoods! Highly recommended to business travelers like myself! Absolutely loved the location and how simple Ruthie made everything from check in to check out. Would absolutely recommend staying here. Clean, comfy spot with a perfect location. Will be back! Great location, photos in description are accurate. Easy directions to get there. Ran into some issues with the place not being ready when we arrived - definitely was an accident by the cleaning people. Ruthie is very kind. The place is nicely maintained and I'd definitely come again. The Third Ward location is great. You can walk to many places. When you're done, you can relax on the balcony, and then watch a movie. Great host and location! Highly recommend for anyone visiting the Milwaukee area. Great location. Very easy to find and short walks to all the best places in the third ward. Located in the Historic 3rd Ward, we're walking distance to all the attractions & amenities of the city. With proximity to I-94; 794; and I-43, direct access to Downtown, lakefront & festival grounds, you could say we're perfectly located. We're 6 blocks from Wisconsin Avenue, walking distance to major employers/office buildings. You'll find yourself walking distance to all the summer festivals, Gallery Night in the 3rd ward, Jazz in the Park & more! Enter dates/guests to find availability/fees. 2 bedroom townhome with 2 queen beds, 1.5 bathrooms, sofa, love seat and air mattress available for extra sleeping. Great for groups! There is a washer and dryer in the unit in case you need to wash clothes during a longer stay. There is a TV with Roku for Netflix and other entertainment apps. There is a gym in the building as well this is open from 6am-11pm daily. Make yourself at home and don't hesitate to reach out with any questions at all! We are from CA and wanted a comfortable place to stay close to local Milwaukee hot spots. This place definitely was perfect for us. The parking was easy, the place was super spacious, & the decor was awesome. It came with a coffee maker, roku tv, & a washer/dryer! Overall a great time! Place was amazing. Would not hesitate to stay again. Free off-street parking a bonus. Our stay was lovely. Instructions for getting into the space were clear. The apartment was clean and well maintained. It’s in a great area - close to restaurants and coffee on foot, and an easy Uber ride to elsewhere in the city. Overall, a great stay in Milwaukee! We loved our stay at Ruthie's place in the Historic Third Ward. The location was absolutely perfect for our weekend in town to see a show. All the cool restaurants, bars and shops of the third ward were just a short walk away, and inside, the apartment was fantastic. It's very comfortable, if a bit basic, but the location is absolutely perfect for a stellar MKE visit. Had an amazing time in the Third Ward at this place! Great value and lots of space. Very accommodating host! Great location near restaurants and attractions. Large very comfortable space. Would highly recommend. Amazing Third Ward location with easy access to all it has to offer. My place is super cozy and comfortable. I want you to feel like you're at home when you're away from home. You will find all the necessary essentials: Shampoo, Body wash, clean linens and towels. I'm only a six minute walk to the downtown area, local coffee shops and shopping area as well. I guarantee you'll find a great restaurant along the way. Our 600 sq foot condo is all yours for your stay. 1 Bedroom, 2 full size roll-away cots, 1 bathroom, and a full kitchen make for an amazing stay. Our 13 foot ceilings and lofted bedroom and bathroom are unique in this one of a kind downtown setting. The view of the park is amazing and we are just a half block walk to Old World 3rd Street which is full of Milwaukee's top Restaurants and downtown nightlife spots. We can comfortably sleep 4 people. This condo can be booked with our other condo unit 302. The have a double connecting door like a hotel where you could add another kitchen and sleep up to 8 more people please go under Jake's profile to see all of our options. Our Location is a half block from Old World 3rd St, which is Milwaukee's most diverse and popular restaurant and entertainment locations. There is plenty of day shopping at the Cheese Mart, Usingers, or Spice House. For dinner you have Maders, Ale Asylum, The Pub Club, Point Burger Express, Brass Alley, Carsons. Late night you have The Pub Club, Who's on 3rd, Red White and Blue Bar, Brat House to name a few. You cannot find a place closer to the BMO Bradley Center or UWM Panther Arena, they are literally next door. Thank you so much. The place was completely accommodating for my short trip. The location couldn’t have been better. Clean, modern and centrally located. Would absolutely boom again. Close to everything! Across the street from a Riverside theater, 3 blocks to the Wisconsin Center, 2 blocks to Pabst Theater, 3 blocks from Zielder Union Square. Close to Panther Arena, lots of shopping and good food. Take the Riverwalk to the Historic Third Ward, or go for a jog to the Art Museum and lakefront. We loved staying at Tamara and Michael’s loft during our trip to Milwaukee. The place was very clean and cozy - loved the decor! The location was great too, with lots to do within walking distance. Definitely recommend this adorable loft! if you are going to a show at the Riverside, this is the place to stay. Wasn't there for long, but nice place in good location. Great place! Great hosts! Always responded quickly. The apartment was very clean and very cute! Central and stylish place. Great place to stay. LOVED! Beautiful apartment in a great location. Tamara and Michael are wonderfully accommodating and easy to communicate with! Modern clean apartment in a central location. Lots of nice extras included, such as a good selection of teas and coffees etc. Those little touches make it a very comfortable stay. Nice place and close to everything. Accommodations were comfortable for 2 and within walking distance of the Riverwalk area and the 3rd Ward area. Will stay again. Great location! Close to everything - walking distance to all we wanted to do. The instructions were clear and easy to follow. Jamie did a great job of communicating with us. It was very clean and had a very comfortable bed. Good water pressure in the shower. It was all we needed for our short stay in Milwaukee! Very thorough instructions and great location. Pros: Great location, fast communication, easy check-in/checkout, apartment was very clean, lots of natural light in apartment, great view Cons: The huge windows with only blinds mean that unless you've brought a sleeping mask or you are able to sleep in a brightly lit room, don't stay here unless you plan to wake up with the sun. We were in town for a wedding which meant both nights we got in pretty late and would have preferred to sleep in a bit. We left pretty frazzled due to lack of sleep. We wouldn't stay here again unless the place was equipped with black-out curtains or it was a business trip where we'd be planning to get up early. This is minor but I was told by Jamie there was no iron so I brought one, when there was in fact an iron-- would have been nice not to lug it around. Also the sink drains slowly. Great experience with Jamie! She was incredibly helpful through the whole process and was beyond accommodating with my schedule and needs. The place was perfect, exactly as advertised and in a very convenient location. I highly recommend for anyone staying in Milwaukee! Excellent place to stay and Jamie was so accommodating! Perfect location for exploring Milwaukee by foot. Easy to walk to everything. Very great fast communication! Great place, great host, great price, great location! This is a no frills place located in the heart of Milwaukee. Couple things to note for future bookers: - Full bed - Wifi is not great (but could easily be fixed for future tenants by upgrading the plan) - Cell service in unit is not great so hopefully Wifi gets fixed - The unit is on the second floor right above the front entrance of the place. I think the building is student housing so we heard drunk people coming back all hours of the night. Excellent stay. Great location. Apartment was very clean and Sarah gave wonderfully detailed instructions. Very organized. I had to contact her once during the stay and she replied immediately. I highly recommend this studio. Comparable to staying in a downtown hotel, but a bit cheaper. Super comfortable full size bed. Nice to have a kitchen and parking just outside the building included in the price! Jamie's place is near all of Milwaukee's major attractions, convenient to Brady Street, downtown, the art museum, and the Third Ward. All are within walking distance, plus you'll be close to lots of restaurants and bars. The apartment is clean, and she provides everything you need. Thanks, Jamie! Jamie’s place is great and she does a great job explaining everything. The place is very centrally located with tons to do in the area. Bed is super comfy and place is very roomy! Would definitely stay again if in the area. This apartment is in a great location! Very clean. This is one of the newest apartment complexes in downtown Milwaukee that has 100% occupancy. You are in the heart of the business and restaurant districts. Free parking comes with the unit. It is locate in the North lot across the street. This space can sleep 6 but we set up the condo for the number of guests that you list for the linens, sheets, and cots added to match that number, so please be accurate in numbers. Parties are not allowed in this unit. It is a condo community and there are other people living in the condo building. Quiet time is 11pm. From the Atelier Website: The Third Ward is the most dynamic submarket in Milwaukee. The Third Ward, known as Milwaukee’s Arts and Fashion District, offers the City’s largest array of restaurants, spas, theatres, galleries, loft offices, and unique boutiques all in a historic warehouse setting. The Third Ward is ideally located steps from Lake Michigan, the Central Business District, and the Milwaukee River Walk. In a Short walk: The Milwaukee Public Market, the Summerfest Grounds, West Elm, Anthropologie, and numerous award winning restaurants. This space is in the perfect location, and was a luxury to stay in! Highly recommend for any Milwaukee visitors. Gorgeous high ceilings and upscale, hip decor. Very secure building. Perfect location for access to downtown and Third Ward. Near highway, but not noisy at all. Parking is across the street. Kitchen is well stocked with dishes and utensils. Bathroom is shower-only and everything is very new and sparkles. Would definitely choose this location again. Great space - very clean and inviting. They communicated well with any and all questions. I'll be back! Great open-space, trendy condo in a very central location! Place is very beautiful and super clean. Kitchen is incredible. Just a couple blocks away from restaurants, bars, and the Public Market. Definitely recommend! This condo was incredible!! Very clean with nice decorations and finishes. Also near many great restaurants and shops- we were able to walk to most of the places we wanted to go! Jake was an excellent host and was very responsive to messages. He had great recommendations for things to do and see in the area. Would definitely stay here again! If you appreciate a clean, open space, then you will feel at home in this apartment. We found it to be a relaxing home base. There is generous closet space for clothes, plenty of towels and a convenient (and clean) kitchen area. The area has lots of restaurants and is on the trolley route. I have a great stay in jakes place. It was well appointed and had a great selection of places to eat nearby. I was in town for a CCIM class and was able to utilize "The Hop" streetcar to shuttle back and forth to my course. I would highly recommend staying at this location. This was the most pleasant stay I have had in a long time! The space was warm and inviting. The details in the furniture and decorations were carefully thought out, It was clean and centrally located to many attractions within walking distance. The access to the building was convenient and I felt safe. If every in Milwaukee again, I will be sure to stay here once more! Thank you for making it such a great place to stay! Studio coach house up stairs above garage and on a quiet street. We live separately across a courtyard. Incl kitchen, bathroom, one full bed with a couch. 2 blocks away from a skyline view and nearby bars. 1 parking space included. Cats and dogs OK. This is a coach house/studio above a garage with one full bed and a small fold-out futon. The two of us (Lauryn & Nathan) live in the house across the courtyard and will be using the garage periodically. You are more than welcome to use our outdoors spaces and you will have your own off-street parking spot! This is a perfect space to come back to after a day of adventuring in Milwaukee and we love this city and have lots of suggestions on things to do, places to eat and how to get around! Brewer's Hill is known for its historic homes. Be sure to go on a Lakefront Brewery tour, then some tipsy swinging in swing park under the bridge. We are also very close to the Brady Street Business (read bars/restaurants) district and Riverwest! Great place to stay. Had everything we needed while we visited with friends and family. Highly recommended. Great location and super friendly hosts - what more can you ask for? You can walk to downtown within an hour at a leisurely pace, which is needed given the heavy amounts of cheese curds and beer that will likely be a staple of your trip's diet! The Lakefront Brewery is just down the street and the Riverwalk provides a nice mainline to use while exploring. Loved the city and the location was pretty outstanding. Highly recommended to anyone who likes to explore. Really amazing city with lots to be proud of! My boyfriend and I really enjoyed our stay here. It had everything we needed. Tony was a very accommodating host, responded quickly to messages and was very reliable. I was thankful to have found the place! Plus, just about everything we wanted to do was about a five minute drive from the carriage house! Perfect little place close to downtown and easy access to major freeways. Nice spot. Very private. Enjoyed. This place was perfect; close to everything, comfortable, and owned by super friendly people! Comfy and private place with a good price. Lauryn was a great host! The unit had everything we needed and the location was close to everything we were looking for. We also really liked her guidebook and recommended locations around the city. I would definitely recommend!